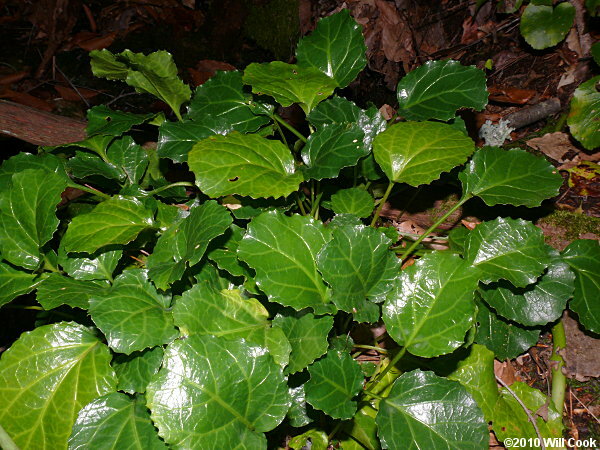 Shortia is a very rare evergreen herbaceous perennial with round, glossy, dark green leaves. 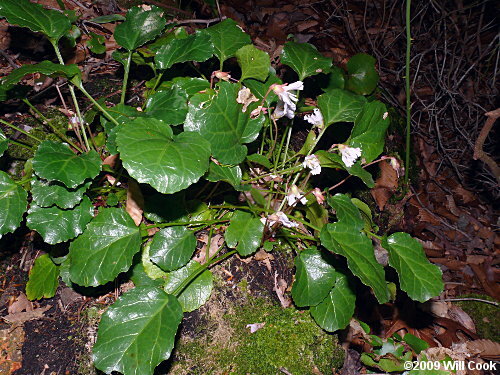 Shortia is listed here as a shrub solely because the USDA PLANTS database lists it as a subshrub. Shortia spreads by underground runners. Two varieties occur in North Carolina: var. galacifolia in Jackson and Transylvania counties, var. brevistyla in McDowell County. Var. 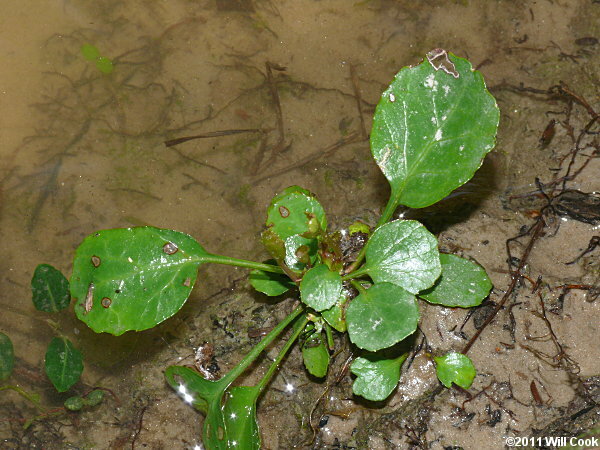 galacifolia also occurs in Oconee and Pickens counties, South Carolina, and Rabun County, Georgia, while var. brevistyla is native nowhere else. 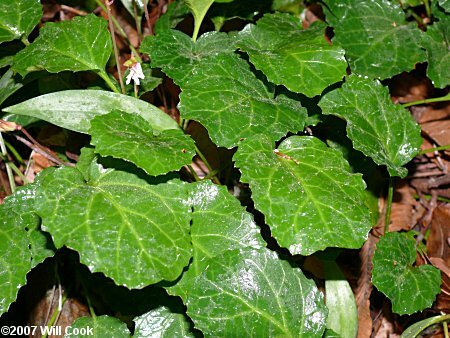 Shortia has been reported from several other counties and states, but it is suspected of being persistent from cultivation there. The two varieties differ in style length: 12-18 mm for var. galacifolia, 6-10 mm for var. brevistyla. 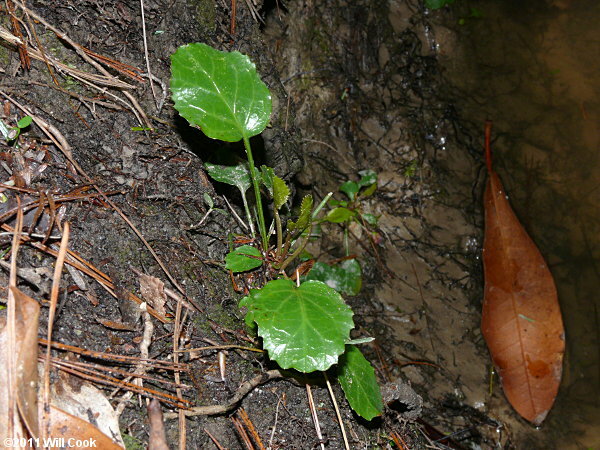 Planted specimen of var. galacifolia, Occoneechee Mountain, Orange Co., NC 10/17/10. 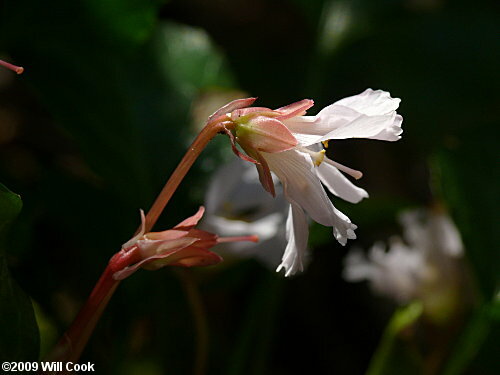 The native habitat for Shortia is streambanks and slopes of gorges in high rainfall areas, usually in deep shade. 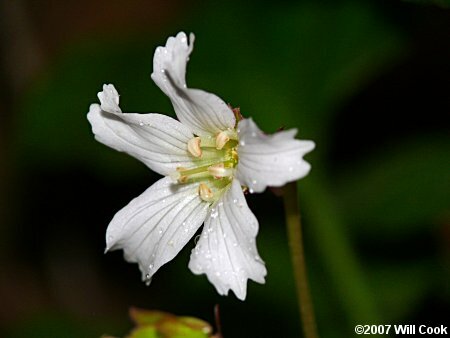 The photographs here are of a presumably planted patch in a ravine near the Eno River, far from its native range. Occoneechee Mountain, Orange Co., NC 10/17/10. In its native range in the western Piedmont, at the base of the mountains. 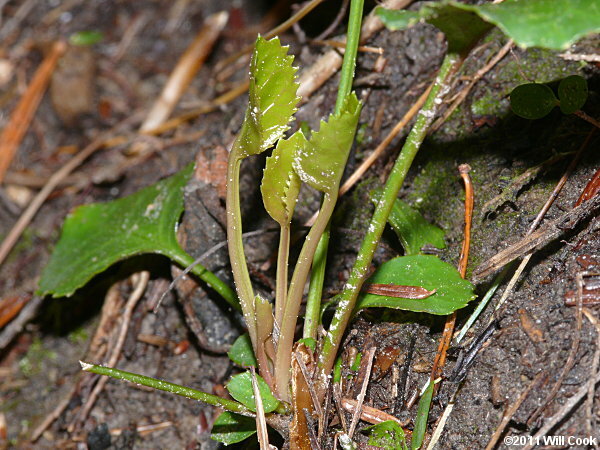 The Shortia at this site is barely clinging on, though extensive patches exist in other areas. Though this site is technically in the Piedmont, the flora here is completely montane. 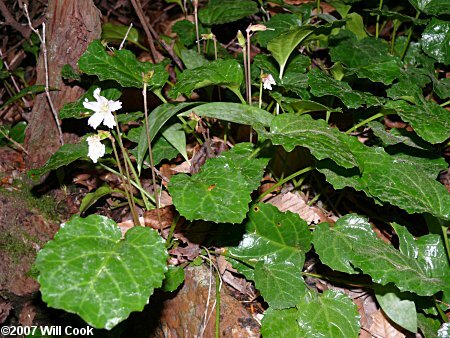 The Shortia in McDowell County, NC is Shortia galacifolia var. brevistyla Davies. It differs from the typical var. 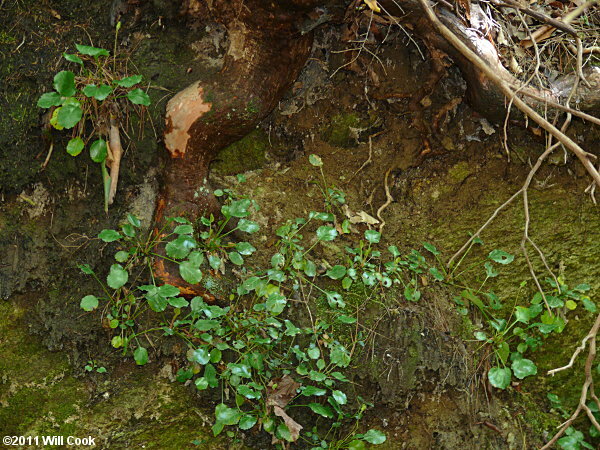 galacifolia in having shorter styles, as mentioned above, as well as slightly shorter filaments and corolla lobes. 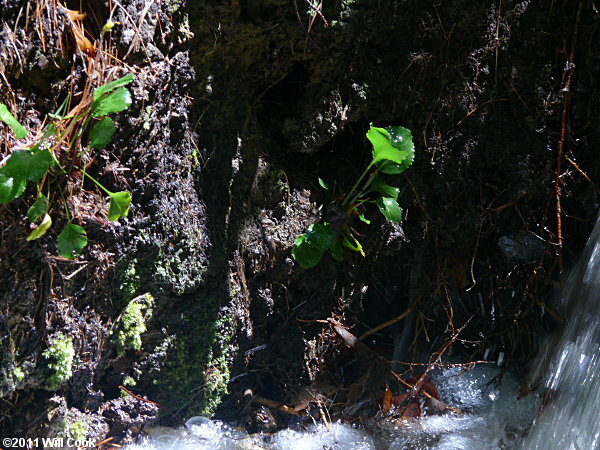 This is a vertical streambank in deep shade. Occoneechee Mountain, Orange Co., NC 4/4/09. 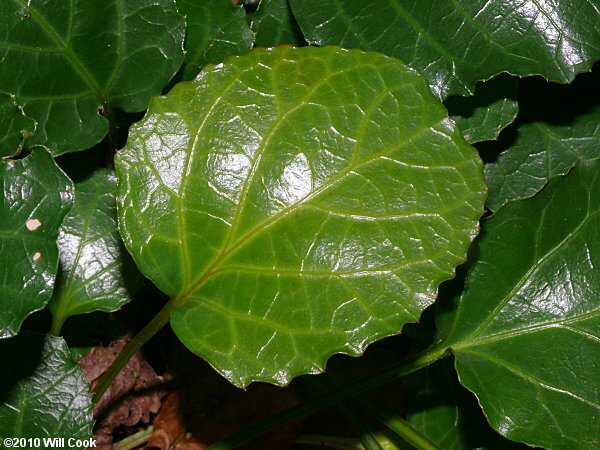 The leaves, which are all basal, are similar to those of Galax (Galax urceolata) but smaller, with pale veins and wavy margins, and without basal lobes. 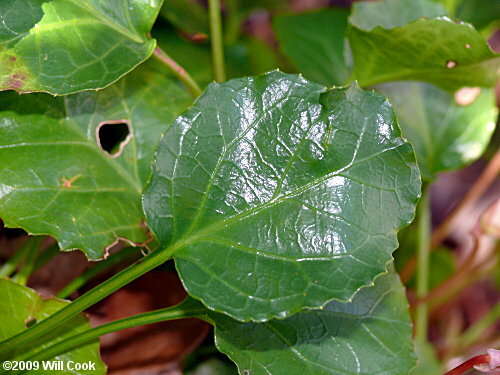 The specific epithet galacifolia means "with Galax-like leaves". 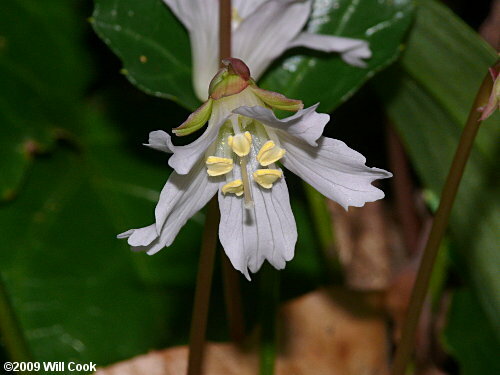 Oconee Bells blooms in early spring. 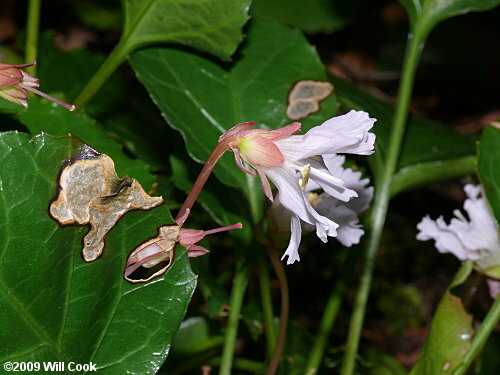 The solitary white to pinkish bell-shaped flowers are borne on leafless stalks. 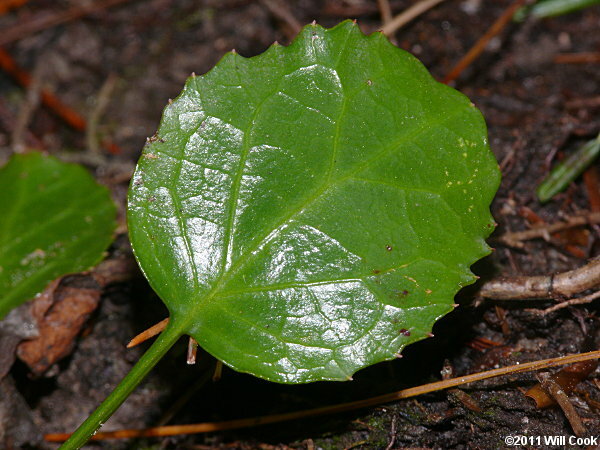 Shortia galacifolia is famed for being a long lost plant. For fifty years after Andre Michaux discovered it in 1788, the specimen, which had fruits but no flowers, languished in a Paris herbarium. Asa Gray discovered the herbarium sheet and named the plant, but was not able to find it despite much effort. 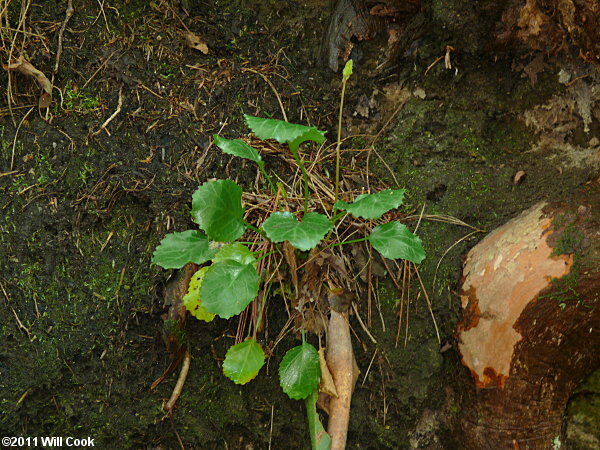 Another five decades passed before any botanist laid eyes on a live plant again! See the links below for more on the story. Occoneechee Mountain, Orange Co., NC 4/12/08. All photographs and text ©2012 by Will Cook unless otherwise indicated. All rights reserved.